In this post I just wanted to share some really good extensions for Visual Studio 2017 that I use on a daily basis. A simple little utility that makes it possible to nest files from the UI, great for ie. web.config files with different versions for release, stage and production. This cool utility can test your configuration transform before commiting them, great to test your transforms very fast. One issue with the current version of configuration transform (3.2) is that it only support configuration files thats placed in the root of project, i've created a pull request that solves this: https://github.com/golavr/ConfigurationTransform/pull/6, so if you nned to work with config files outside of the root - just download and build the version with my fix and place the files in your VS-extentions folder. 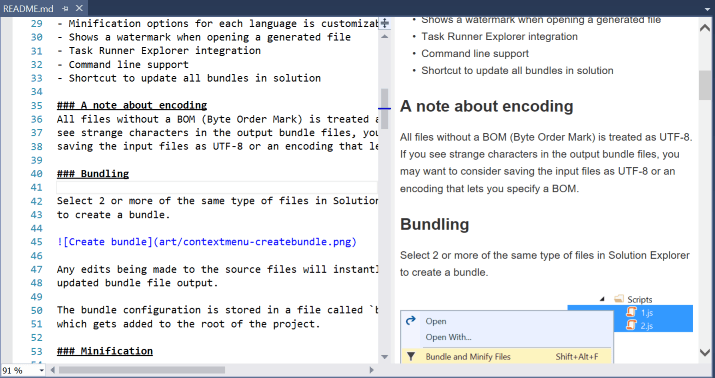 Provides a markdown editor inside Visual Studio, great when you want to edit your Github readme.md-files.